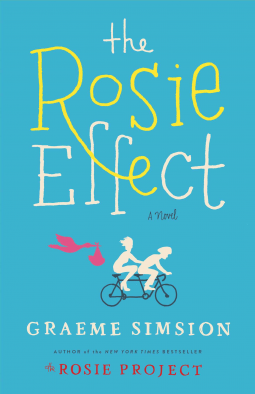 I was so excited when NetGalley gave me an ARC of The Rosie Effect! This was one of my favorite books last year. and Don and Rosie are happily married and living in New York. But they’re about to face a new challenge because— surprise!—Rosie is pregnant. What I Say....I loved it! The Rosie Project was such a different take on a love story, with such unique characters. It was one of those books where you don't want the story to end. So Don and Rosie are back, and they are now living in New York and expecting a baby. The news of his impending fatherhood starts Don in a series of misadventures as he tries to cope with this life changing news. But what I found truly interesting is that while Don may have some interpersonal issues, in this chapter of their story, it was Rosie who struggled to assimilate all of her emotions and how a baby would impact her life, both at school and with Don. Don's communication challenges don't stop him from becoming the de facto leader of a men's support group, helping Gene's kids accept their parent's split, or supporting Rosie in all the ways he knows how. So the person with the worst social skills becomes the glue that binds the "normal" people together. I hope this isn't the last I see of Don and Rosie - I was sorry to say goodbye to them again.